Signed limited edition prints by the great marine artist. Also open edition prints, both on paper and on canvas. 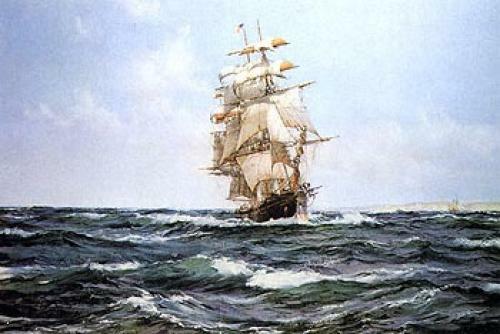 Montague Dawson was born in Chiswick, West London, Montague Dawson became perhaps the greatest painter of the sea and sailing ships of the first part of the 20h century. His original paintings are scarce and extremely expensive and many of the original 20th century signed colour prints are now faded, lost or damaged. His father and grandfather were both marine painters and this maritime background was reinforced when, early in his life, his family moved to Smugglers House on Southampton Water, on England's south coast. Dawson never went to art school but, around 1910, he joined a commercial art studio in London, working on posters and illustrations. Joining the Royal Navy at the outbreak of the First World War, Dawson met Charles Napier Hemy who was to have a great influence on the young man's art. Dawson had supplied illustrations to the Sphere magazine during the First World War and after the war set up as a painter and illustrator. 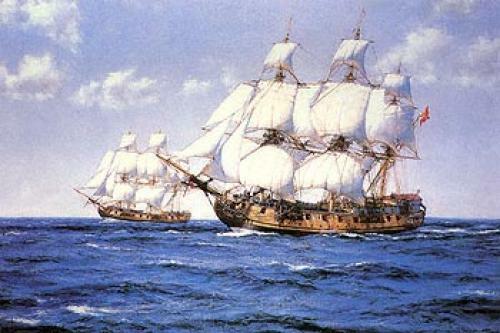 He concentrated on historical subjects and sailing ships, usually under full sail on the deep ocean. He achieved great commercial success starting in the 1920's, showing at the Royal Academy from 1916 to 1936 and regularly at the Royal Society of Marine Artists, of which he was a member. Dawson moved to Milford-on-sea in Hampshire in the 1930's. In the Second World War he illustrated events of the war for the Sphere and afterwards continued a painting career that was financially one of the most successful of the 20th century, dying in Sussex in 1973. The canvas prints are made using the high-quality digital goutelette process, and are clear-varnished. There is a two-inch clear border all round to wrap around and secure to the stretcher.